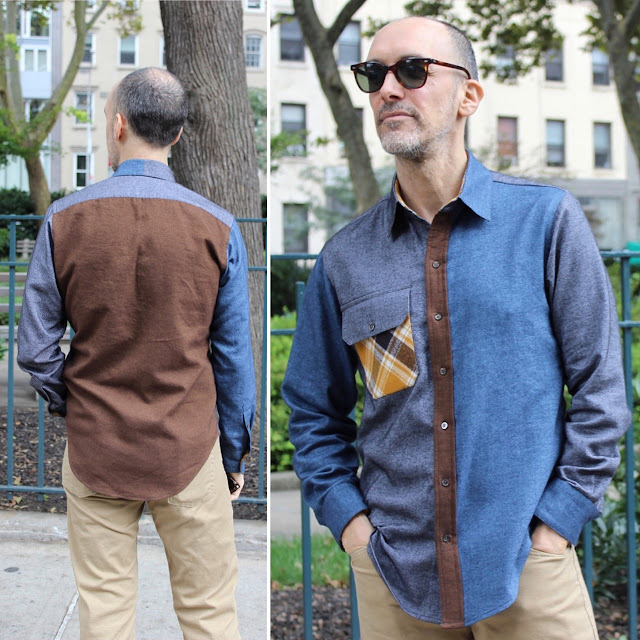 male pattern boldness: Style Maker Fabrics Fall Blog Tour -- My Color Blocked Shirt REVEAL! Style Maker Fabrics Fall Blog Tour -- My Color Blocked Shirt REVEAL! I was excited to be invited to participate in the Style Maker Fabrics Fall Blog Tour this year -- I love this kind of challenge and it's always fun to see what other people make. What Michelle Stoffel, the owner, has done -- brilliantly -- is to create a fall fabric collection. (You can view it here. ) There's a video of each fabric being described and handled (it's long but VERY informative) so you can really get a sense of what each fabric feels like before purchasing. Naturally you can also order swatches. I wanted to try my hand again at color blocking. 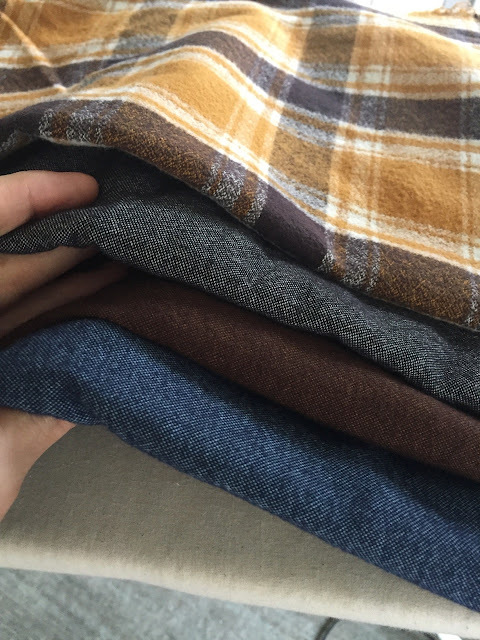 I chose a mix of solid cotton chambray flannels in three colors (blue, black, and brown), along with a touch of brown and mustard flannel plaid (cut on the bias and interfaced to prevent stretching). 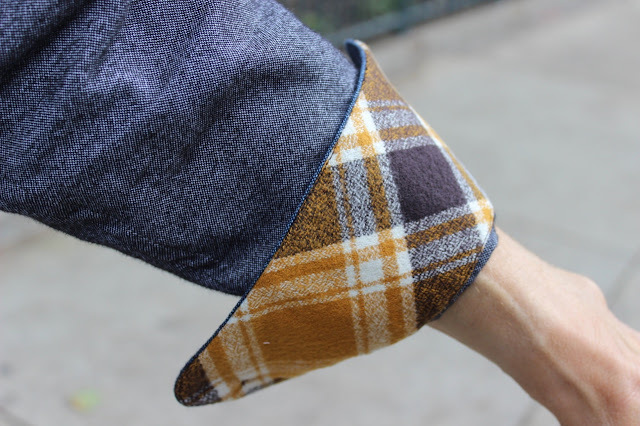 The plaid is actually quite beefy and would be perfect for a shirt or shirt jacket. 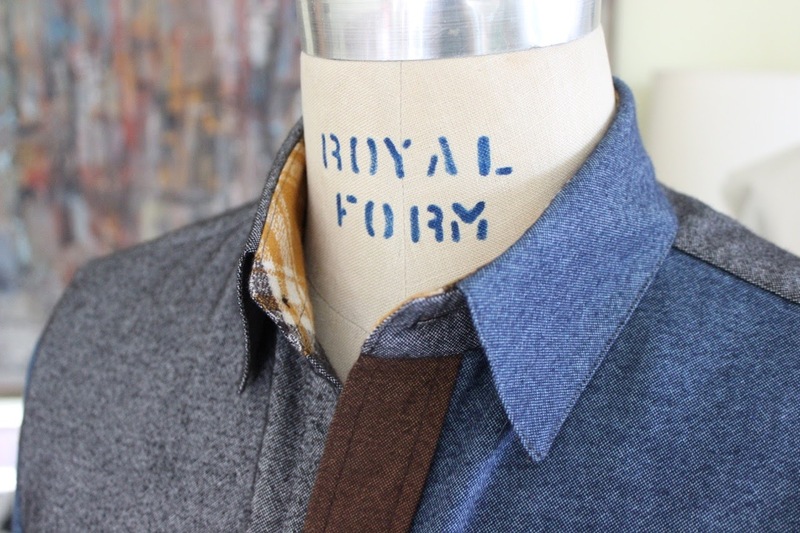 The chambrays are as soft as cashmere and require gentle handling when sewing. 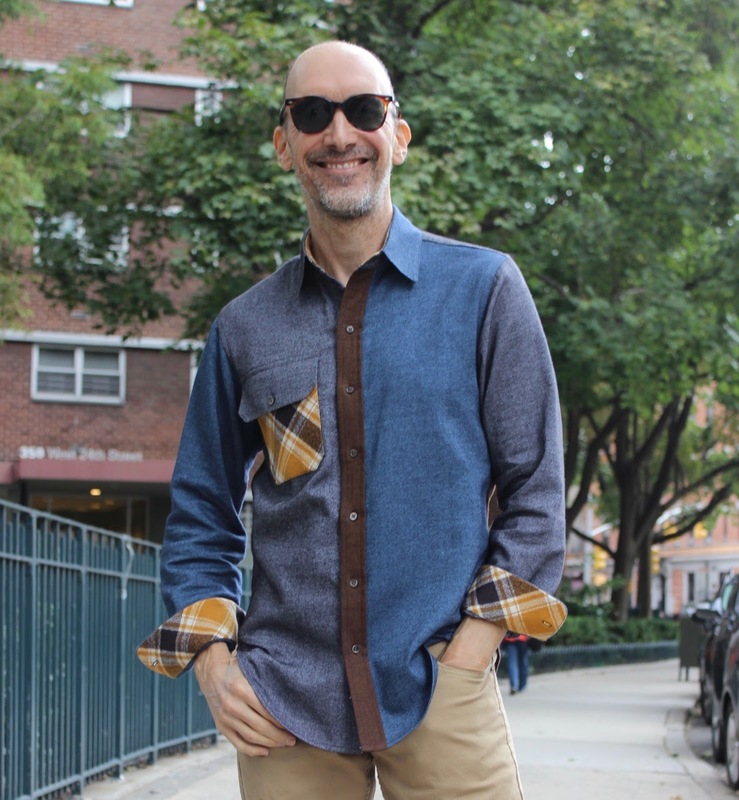 (These aren't the stiffer chambrays one associates with denim or denim-look shirts.) 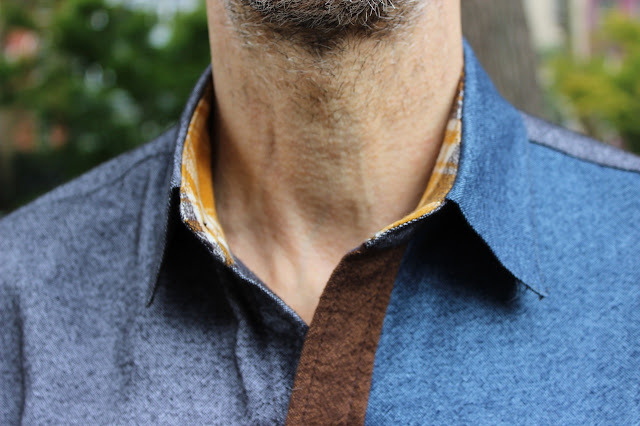 I recommend stay-stitching the neckline to prevent stretching before the collar is attached. One of the fun things about color blocking is the challenge of figuring out which color goes where. As you can see, I used primarily the blue and gray for the shirt fronts and brown for the back. 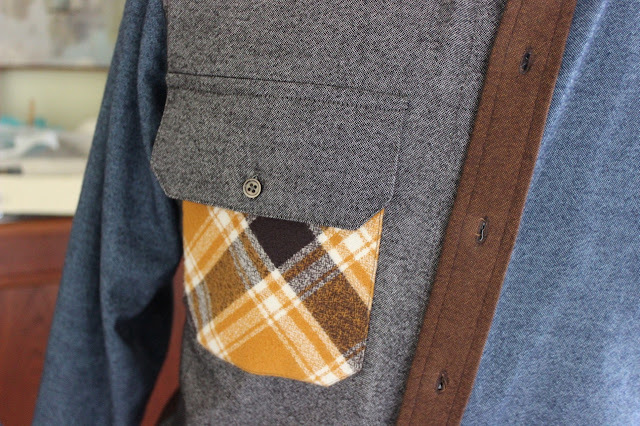 I opted for plaid accents on the inside collar stand, the inside cuffs, and I added a single front pocket (with solid pocket flap to tame it a bit). Naturally, the plaid has the most visual impact but I think it's pretty well balanced. 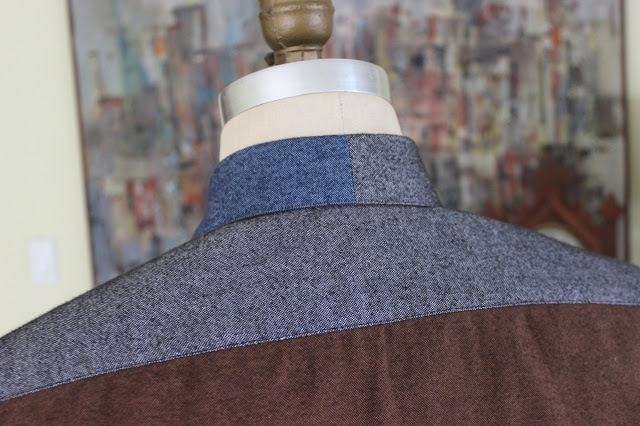 I am particularly proud of the upper collar, which I split in two: gray on one side, blue on the other. My buttons are genuine mother-of-pearl. Here are links to the actual fabrics I ordered. I used one yard of each of the solids and half a yard of the plaid (each approx. 44" wide) and there wasn't a whole lot left. If you're going with a single solid, I'd order three yards. Thank you again, Michelle of Style Maker Fabrics, for inviting me to participate! A little birdie has told me that tomorrow's Style Maker Fabrics Fall Blog Tour reveal will be Holly of the blog Holly Dolly Darling -- do check her out! What a great shirt-wish it was mine! Beautifully made too! 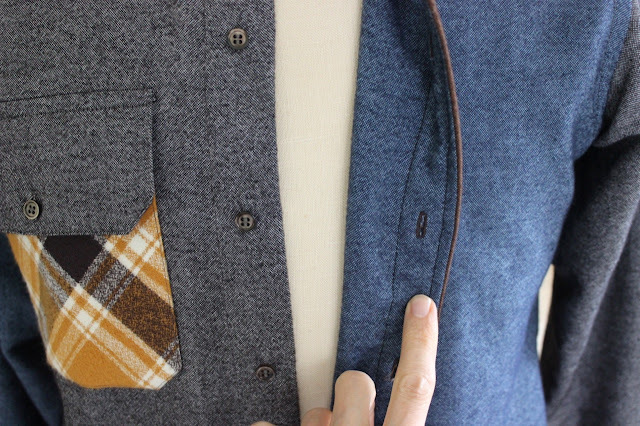 Normally, I'd place the pocket on the left, but for reasons of color balance, I ended up putting it on the right. The details are amazing! Meticulous placement and execution. It's only going to look smarter with age. Your sewmanship is impeccable as usual but I don't love the pocket. The plaid is just too jarring, but maybe I'm just old and cranky! A very successful use of four fabrics in one shirt. Am so glad that we get a good look at the beautiful plaid which is my favorite. I also love the plaid. It's also sturdier than the solid chambrays. The color blocking is perfect. Beautiful shirt, so well made! Oh, such beautifully-turned edges! What exquisite workmanship! If you ever turn your hand to making a Chanel-type jacket you'd have an eager audience, I'm sure. Love the shirt! What pattern did you use. I used a vintage 70's pattern, Butterick 4575. I love how subtle this colorblocking is. It takes you a minute to realize how much is colorblocked and I love it! Impeccable! I'd also like to know which pattern you used. I bought Dorothy Moore's 'Pattern drafting and dressingmaking' book, after you mentioned it in an earlier post but I haven't had a chance to try her method yet. If you used your drafted pattern from her book for this shirt, I definitely have to give it a go. I used a vintage 70's pattern in my stash, Butterick 4575, with a few relatively minor changes. 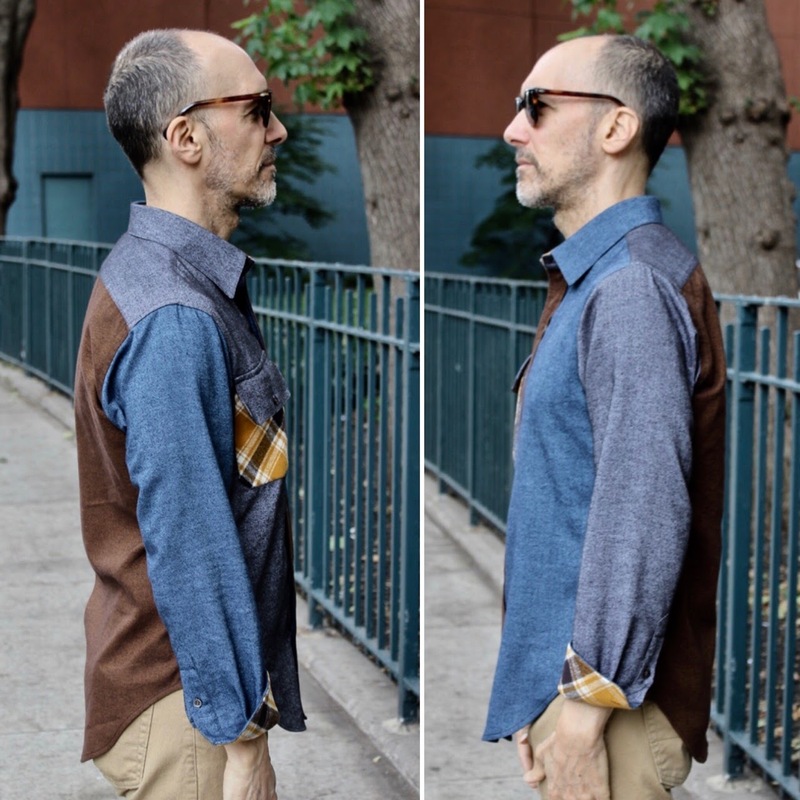 Love your color blocked shirt! Adding the plaid fabric was a great idea! As always, a beautifully made shirt. I've always admired how great your shirt making skills are. You could open up your own shop. This one is especially awesome. The section on colors and plaid are a great combination.